This extraordinary four bedroom estate features multiple gables with decorative wood brackets, arched windows, and a stone and siding facade for undeniable craftsman character. At the heart of the home, a magnificent cathedral ceiling adds space and stature to the impressive great room, which accesses both back porches. Sharing the great room's cathedral ceiling, the loft makes an excellent reading nook. Tray ceilings adorn the dining room and library/media room, while all four bedrooms enjoy cathedral ceilings. A sizable kitchen is open to a large gathering room for ultimate family togetherness. 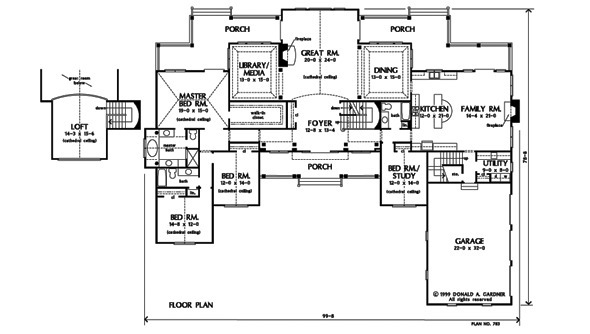 The master suite features back porch access, a lavish, private bath, and an oversized walk-in closet. A spacious bonus room is located over the three car garage for further expansion. 2nd Floor: 250 Sq. Ft. 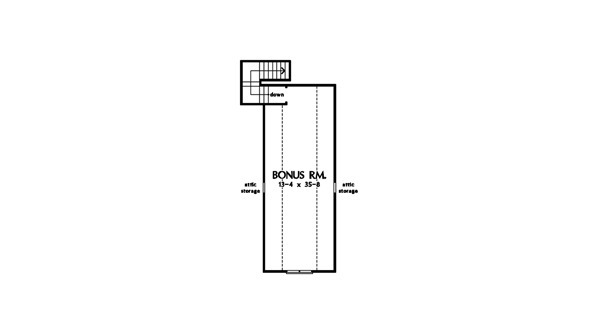 Bonus Room: 490 Sq. 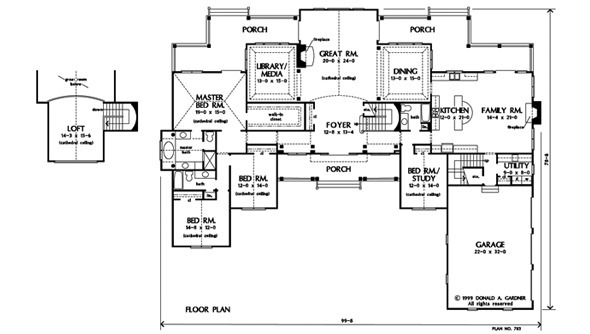 Ft.
House Dimensions: 99' 8" x 78' 8"
Great Room: 20' 0" x 24' 0"
Bonus Room (Vaulted): 13' 4" x 35' 8" x 8' 0"
Garage : 22' 0" x 32' 0" x 0' 0"
Master Bedroom (Cathedral): 19' 0" x 15' 0" x 17' 4"
Bedroom / Study (Cathedral): 12' 0" x 14' 0" x 15' 10"
Bedroom #2 (Cathedral): 14' 8" x 12' 0" x 17' 2"
Bedroom #3 (Cathedral): 12' 0" x 14' 0" x 15' 10"
Porch - Left : 24' 4" x 7' 4" x 0' 0"
Porch - Right : 26' 8" x 7' 4" x 0' 0"
Den / Library (Tray): 13' 0" x 15' 0" x 10' 5"
Loft / Study (Cathedral): 14' 3" x 15' 6" x 16' 4"
Storage (1st Fl.) : 4' 4" x 3' 4" x 0' 0"
Other : 14' 4" x 21' 0" x 9' 0"
Foyer : 12' 8" x 13' 4" x 9' 0"
Dining Room (Tray): 13' 0" x 15' 0" x 10' 5"
Great Room (Cathedral): 20' 0" x 24' 0" x 26' 10"
Kitchen : 12' 0" x 21' 0" x 9' 0"